Now we’re gonna switch over to what I eat. And I’ll have to open that up. And we’ll do that for about 20 minutes and then we’ll take a break. So the question will be, “Yeah, I kind of understand you don’t eat bread but if you don’t eat bread, what on earth do you eat? 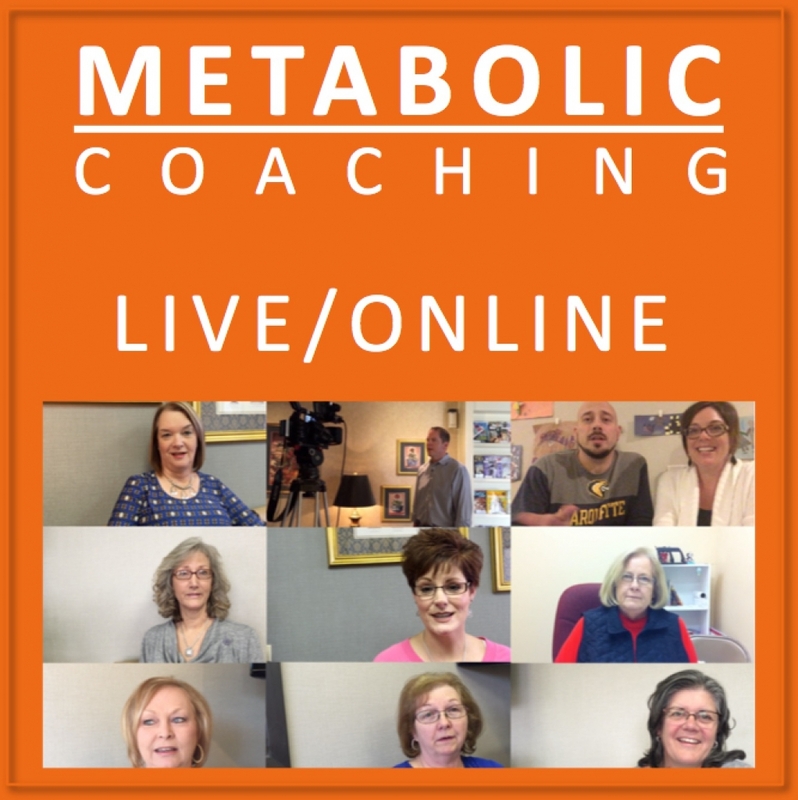 What do your meals look like?” And that’s what this section is about. And basically, what I did was for the last few weeks I just took pictures of every single meal that I ate so I could show you what it looks like. 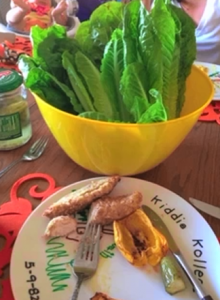 This is pretty typical; there are a lot of lessons in this picture, but basically there’s chicken, and there’s a lot of lettuce. And this is what I would call as my meat and protein diet. But then you look in the front and you say, “Hey, what on earth are those?” Those are potatoes. I’m not trying to lose weight. So I’m just trying to maintain my weight. 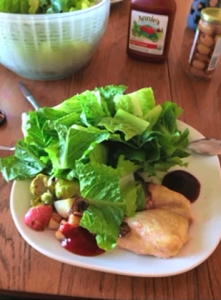 So yeah, those are few potatoes there and these are brussels sprouts.Always in the back of the picture you’ll see this — that’s a big giant bowl of lettuce. That’s because after I eat the first plate, I eat a whole other plate. I’ll eat more lettuce if I want more lettuce, I’ll eat more chicken if I want more chicken, I’ll eat more brussels sprouts if I want more brussels sprouts, but I won’t eat more potatoes. And I never leave the table hungry. I’ll eat all the olives that I want. 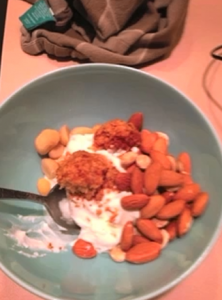 And sometimes if I’m done eating I think I’m still hungry, right after dinner I’ll just eat a couple of nuts. Just, I never leave hungry. This is fried chicken. And you might say, “Hey, you’re not supposed to have fried chicken because it’s breaded.” This is breaded with almond four and flax meal — almond flour and ground flaxseed. And these are some vegetables. I was like halfway through dinner before I took the picture, right? And then there’s a big thing of lettuce and what I would do is just pop the chicken right in the lettuce and eat it. This is breakfast one morning, my son made this. This is Greek yogurt — Greek yogurt is high fat, full fat yogurt. If you’re gonna buy yogurt, don’t ever get it flavored and sugared because you have to flavor it yourself and if you want to put sweetener, put in approved sweetener yourself. But this is Greek yogurt with a bunch of nuts on top, and these are little cookies, little coconut cookies that my wife cooked. She’s a baker. I’m not a baker. So the whole thing is super low carb. 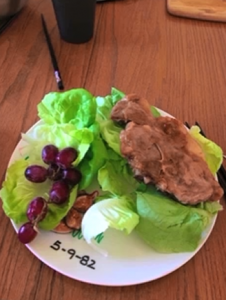 This is pork chop, lettuce, grapes. How many carbs is a grape? One. One, two, three, four, five, six, seven — seven carbs in the grapes. Grapes are one of those foods to avoid because they can get too high in carbs. So this is actually the second plate at dinner — we had meatloaf. 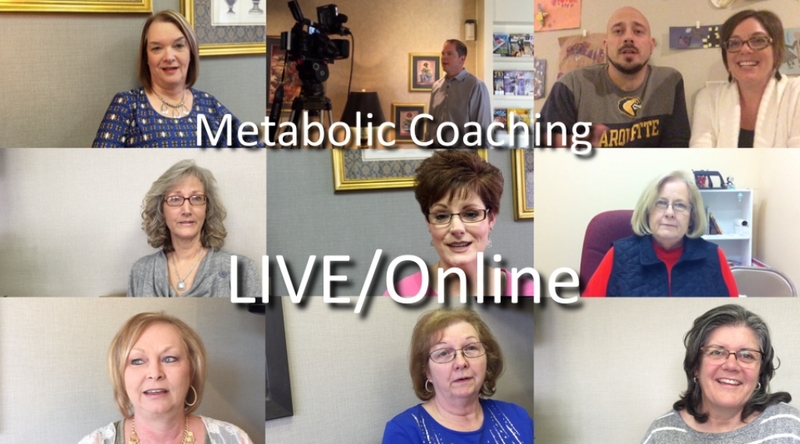 What are you gonna eat with meatloaf? 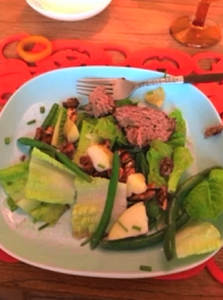 So there’s meatloaf, underneath the meatloaf, those are some potatoes, pecans and lettuce and beans, green beans. Breakfast. Breakfast is eggs. 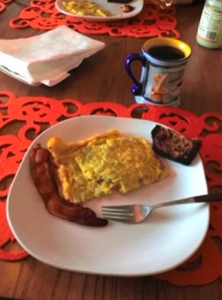 Every morning, breakfast is one of two things, it’s either eggs with bacon or sausage or it is a protein smoothie. This is eggs with bacon and right over here this is a little bread. And this little bread is made with almond flour and so you can have all that bread that you want and it’s not gonna raise your sugar one bit. And so you might say, “So your wife, that morning, woke up and cooked almond-flour bread for you. Amazing.” No. I made that two weeks ago. It’s been sitting frozen in the freezer. It’s frozen so you just pop it in the toaster. Hotdogs, man, we eat hotdogs all the time. What does a hotdog look like without a bun? Tada. I put stuff all over the hotdog, the only problem is you have to eat it with a fork instead of your hands. But this is guacamole, eat all the guacamole you want. Notice back here is a big thing of lettuce because I always eat as much lettuce as I want and as much protein as I want. And after I eat these two hotdogs, what am I probably gonna do? 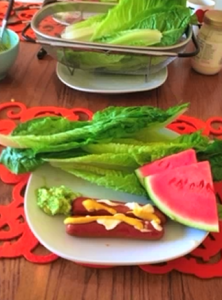 I’m gonna eat the watermelon, or I’m also gonna probably eat another hotdog and probably eat more lettuce. But that might be about all the watermelon I eat. This is a spaghetti squash, for those of you who haven’t used it. 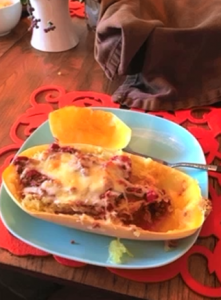 It’s really convenient, you take the seeds out, you just cut it in half and bake it for about thirty minutes, and it makes little strings in it which are like spaghetti noodles, and it’s very low carb and you just put your spaghetti sauce right on top with meat in it, put your cheese on top, all the sauce, all the meat you want. 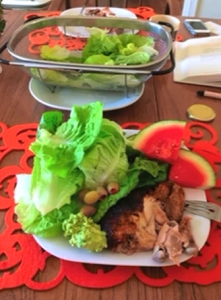 This is chicken, salad, olives, watermelon, lots of lettuce and guacamole. So this is my wife, she’s cooking. And she calls these egg cups. Because you don’t have time — one of the reasons you buy processed food and you buy packaged food is because it’s so convenient. They do package it for your convenience. 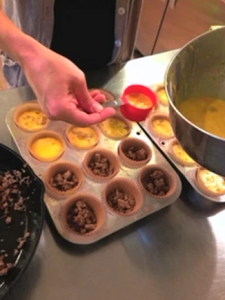 So what my wife will do is she’ll take two dozen, three dozen eggs, mix them all up, she cooked a whole bunch of sausage, she drops the sausage inside muffin cups, puts the eggs on top and just slides them into the oven. So she can bake two dozen, three dozen egg cups at once and then they just sit in the freezer. And you can have them every single day for a month. We eat so many eggs, it doesn’t last us a month.